Becoming a helicopter rescue swimmer is much more difficult than actually being one (most of the time), but for those who make it through the training, their job becomes one of delivering hope. All rescue crews are teams, but when swimmers leave the helicopter in an attempt to save someone, the outcome is their fault and they know it. It’s the real price they pay for the job — praise if they save you, a lifetime of guilt if they don’t. But whatever pushes someone to go through the pain of getting the world’s greatest job, as a potential customer of their service, you should understand a few things about their training and what they went through to be there, shouting at you over the wind and waves and screaming engine noise. This is why you should do whatever the nice swimmer tells you. The Coast Guard allows anyone who is qualified to sign up for any job they want. If you qualify, are willing to wait and willing to go to the school, you can. Of course, you have to make it into the Coast Guard first and graduate boot camp. 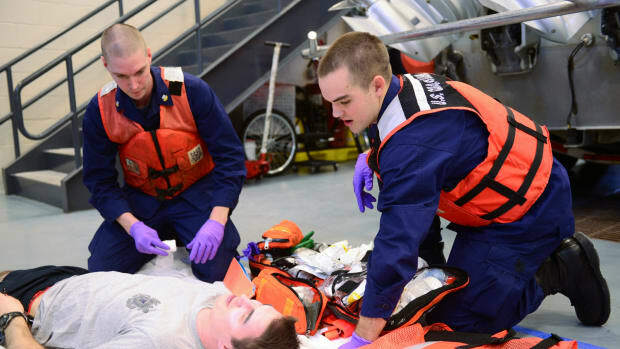 Candidates typically spend six months at their first duty station waiting on the list to get orders to “A-School” — the job specific training for any Coast Guard position. Open to enlisted members only, Aviation Survival Technician Class “A” School is in Elizabeth City, North Carolina, and lasts six months (when I went through it was four). It’s difficult to put into writing how tough it is (no, it is not as hard as SEAL training and anyone who says so hasn’t been to either), but for certain it is likely the most difficult physical and mental challenge you can imagine that doesn’t end in permanent disability. The training is meant to do more than just teach tactics and procedures. That can be done quite easily. The unwritten goal of the training is to show students their limits. 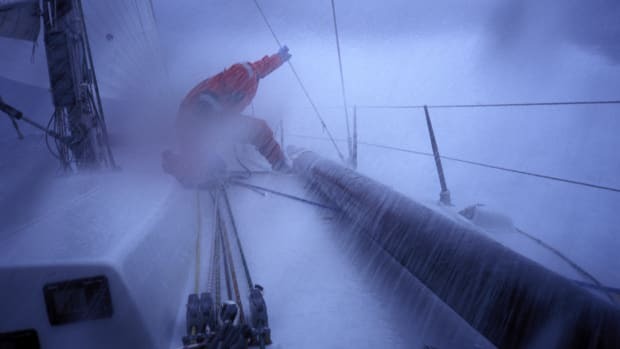 While most search and rescue cases faced by rescue swimmers will not require significant exertion, some cases may require extreme discomfort and effort. The school is not designed to push students and see if they break; it is designed to push students until they break, so they know where that line is. The most valuable thing I learned during my training — that I would not have learned otherwise — is that when I am underwater, and my oxygen-deprived lungs begin lurching for air, I’m a good minute away from being in real trouble. How that translated into safety happened over a year later on a case that had me underwater longer than I wanted. What would panic me before the school (lurching for air) instead calmed me down. “You’re okay, plenty of time,” I thought. You would think six months would be enough, but it isn’t. After A-School students are assigned to their first unit, where they will spend another six months (roughly), then they earn the right to become aircrew on either the H-60 or H-65 helicopter (or both). Then they have to learn every system, its functions, memorize emergency procedures and spout them from memory to instructors and examiners to prove to the crews already flying rescue that they belong in the plane with them. 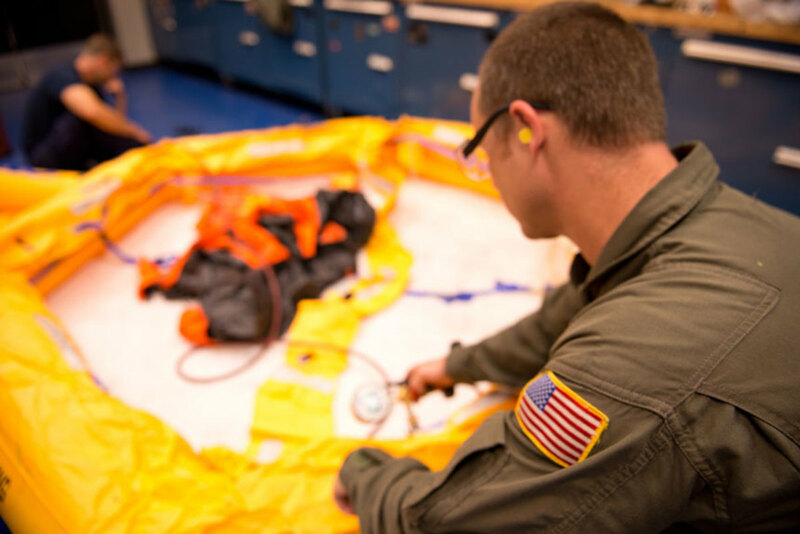 Aviation Survival Technicians inspect and maintain life rafts, life vests etc. Sometime during that training, while doing the full-time work of maintaining and repairing rescue and survival equipment, new swimmers have to attend seven weeks of Emergency Medical Technician School in Petaluma, California. Before he or she becomes a dutystanding rescue swimmer and member of a ready crew, a rescue swimmer has been in one form of training or another for more than a year — months of that in full-time training. As if all that training wasn’t enough, sometime after a rescue swimmer becomes qualified he or she has to attend AHRS (Advanced Helicopter Rescue School.) This is where they learn, along with the rest of the helicopter crew, how to handle cliff rescues, cave rescues (it’s a thing) and, with the help of the Columbia River Bar (the most consistently rough water in the U.S.) how to handle themselves while free-swimming in 3-meter high breaking waves. AHRS is a lesson in advanced rescue tactics and helicopter crews often attend several times over a career to hone their skills. There is no such thing as a “typical” rescue swimmer. I’ve worked with 250-pound masses of humanity who lived in the gym and five-foot, five-inch, 140-pound rescue swimmers with the imposing physical presence of my first accountant. If you think the job is “manly,” then you’re missing the point. The ocean is stronger than everyone. While the job is hard, most of the challenge is about mental toughness. I don’t don’t know if I’ve met anyone as mentally tough as my friend Sara Faulkner. 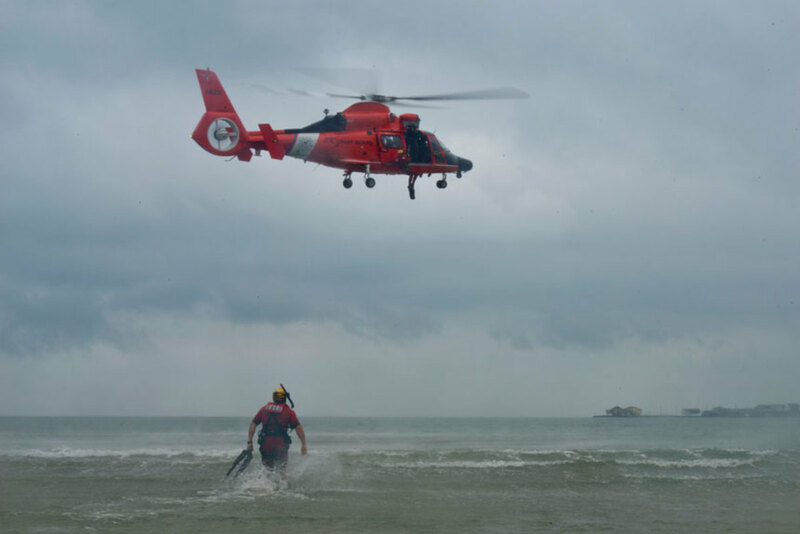 Though not the first female Helicopter Rescue Swimmer, she was the first to get the job, do the job and then retire from the job after a full Coast Guard career. 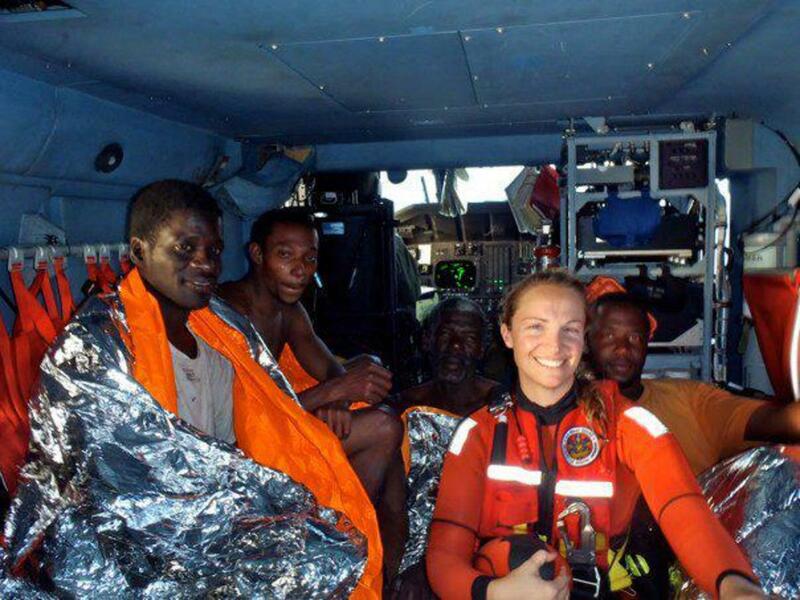 Sara Faulkner - following a rescue of four from the open ocean. Faulkner was on my very short list of swimmers I would most want to be in the helicopter if I needed saving out there.No one on the list looked like what you envision when you think, “macho.” There are plenty of men-of-steel rescue swimmers, but trust me, that kind of toughness is just a side effect from some of the lifestyle that led them to become swimmers. Deadlifting 400 pounds is not a job requirement. Staying cool under pressure is. So, if you find yourself unlucky enough to need a rescue swimmer and lucky enough to be talking with one while they are on the job, listen up and do whatever the nice rescue swimmer tells you to. They have spent a very long time training, learning, pushing themselves and learning their jobs, which is to get you out of whatever mess you happen to be in at the time. You may be at the end of the very worst day of your life, but they are having the time of theirs and appear calm for a reason; because they are. 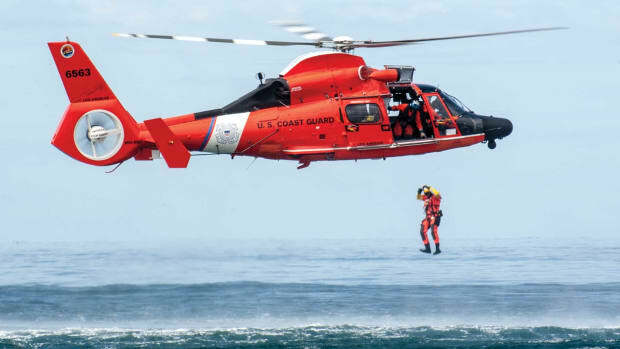 Being a United States Coast Guard Helicopter Rescue Swimmer may just be the best job in the world. Mario Vittone explains what it takes to make the cut. 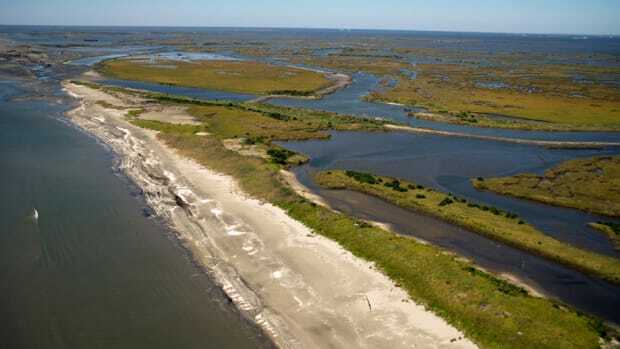 What would you do if you found yourself cold and alone on this desolate stretch of beach overnight? Lighting a fire is a good place to start. There's a 40 percent chance you'll never be seen again — alive or dead —if you fall overboard at sea. It is perhaps the most dangerous boating situation you can find yourself in, writes Mario Vittone in this week's Lifelines: Safety And Rescue At Sea blog. I knew a North Carolina highway patrol officer who once told me, “I’ve never unbuckled a dead man. 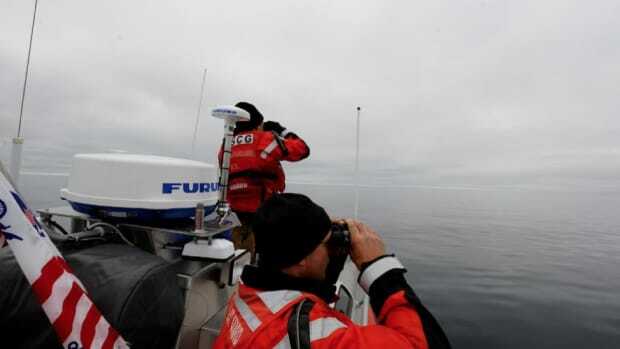 Visual signals are key for a successful rescue at sea. If you want the Coast Guard to find your crew, think bigger and brighter. 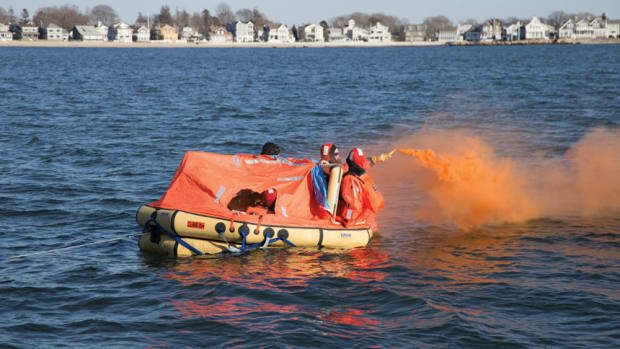 Read the U.S. Coast Guard’s annual boating statistics and you would think it never happens; the most common reason a boater calls Mayday, the topic of so many news stories involving rescue, the thing that many maritime rescuers respond to most of the time barely gets a mention. 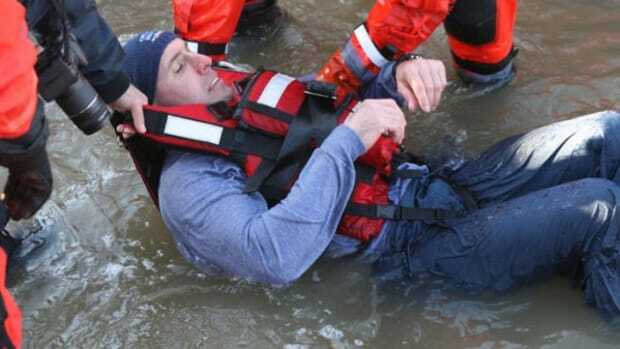 Victims of cold-water immersion aren't out of trouble after being rescued. 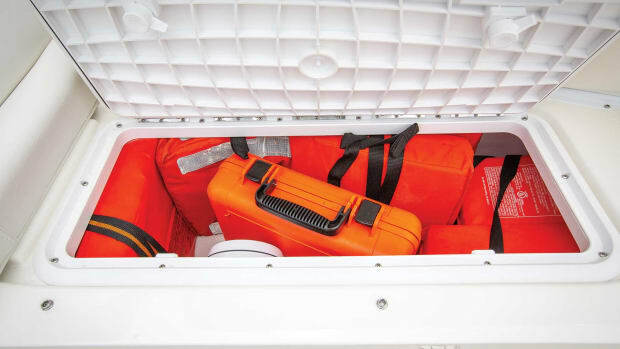 In his latest installment of Lifelines: Safety And Rescue At Sea, Mario Vittone discusses what to do — and what not to do — when treating someone with hypothermia. No one likes to change when it comes to new rules or regulations that restrict free will. Professionals should decide for themselves what is right or wrong, based on their knowledge and experience, and apply it to operate their vessel safely and effectively. The only problem is just how often that model fails. Mario Vittone explains why experience is a rotten teacher in this week's installment of Lifelines: Safety And Rescue at Sea.